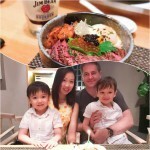 TRATTORIA BONISSIMA FOR HEARTY ITALIAN | Beverly's Net: family. food. fashion. 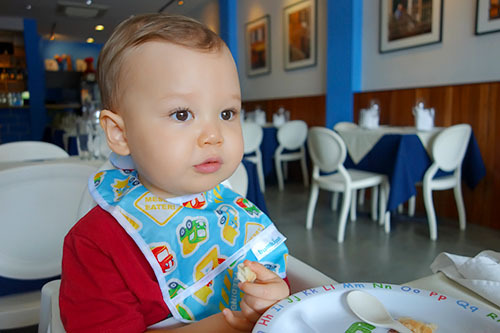 TRATTORIA BONISSIMA FOR HEARTY ITALIAN – Beverly's Net: family. food. fashion. Come to think of it, I don’t often eat Italian food in Singapore. I don’t mean the random, mainstream Italian food catered for the masses (OMG I really sound like a food snob here! Eeek!! Sorry!) but rather classic, rustic, homestyle Italian. I guess partly because they tend to be fine-dining and pretty expensive, so I feel like I have to be celebrating an occasion to warrant the splurge. Trattoria Bonissima has really good reviews online (yes I’m the type to go suss a place out before I eat there), and it’s not hard to see why. 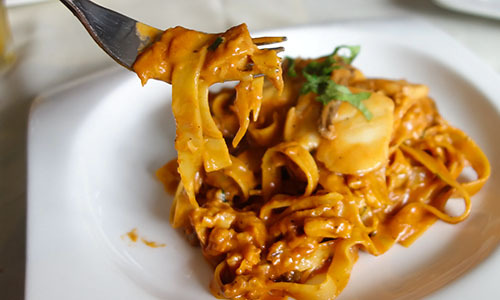 Helmed by Italian chef Andrea Badiali, Trattoria Bonissima is a casual, cozy restaurant serving hearty Italian food. 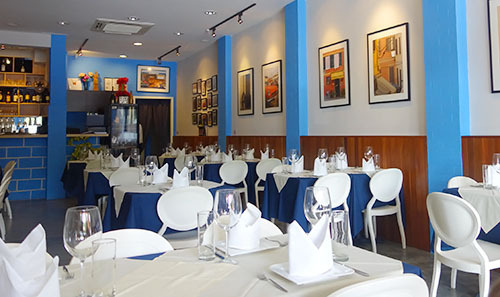 All decked out in blue and white linen, it feels homely and lovely, with very warm and friendly service. The food came out swiftly, and they even help you portion out the dishes if you’re ordering to share. A very nice touch. The first dish (and IMHO the best dish) was the Stracciata – thinly sliced striploin on a bed of rocket, dressed with truffle oil, balsamic and parmesan. It was so good, we actually couldn’t quite believe it. I actually wouldn’t have thought of ordering this dish if I saw it on the menu, and so was very glad that we were recommended to. The striploin is gorgeous. Silky, tender, melt-in-your-mouth. And what makes it stand out is this complex concoction of truffle oil and balsamic… which had us smacking our lips in delight. You know how balsamic sauce on a salad can just be too tangy and a bit much? I guess they must use really high quality balsamic.. and it’s also tempered with the fullness of the taste of truffle oil. The blend goes together like one freakin’ happy marriage and makes the beef just taste splendid. It went very well with the juicy, sweet tomatoes, and is a wonderful appetizer that is a total MUST ORDER when you visit. Seriously, you’re mad if you don’t order it. The portion size is also hefty and excellent to be shared. Boy, I pretty much typed up an essay on just this one dish. But oh geez it’s so bloody good I can barely stand it! I’d go back there for the Stracciata alone. 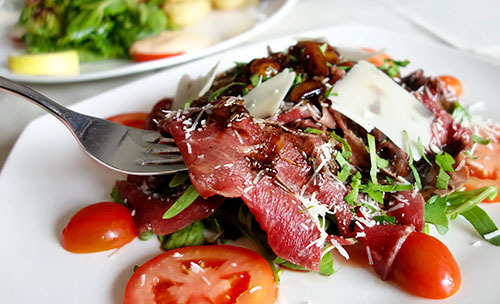 Stracciata – thinly sliced striploin on a bed of rocket, dressed with truffle oil, balsamic and parmesan ($19). FAINT. The other appetizer was this astonishing tower of Calamari Fritti. Don’t be silly an order this appetizer just for yourself, as it’s large enough to be a main meal. You definitely need to share this. 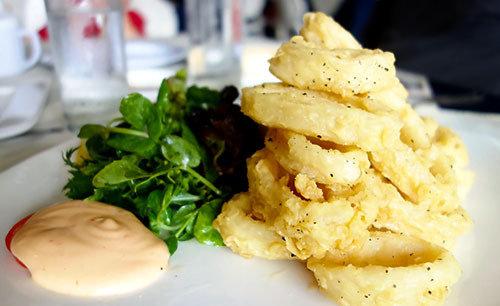 The tumble of calamari come in large rings, dipped in a light batter and are all crispy and airy. At first, the light colour of the batter made me think it was undercooked (I’m used to the darker brown versions in Australia), but nope, the batter was all light and well cooked. I found the calamari itself to be not as sweet as I normally like them to be, but they were very good dipped in the aioli. The restaurant also prides themselves (or, at least our waiter introduced it with a big flourish!) on their Pepperoncino flakes, which are dried chilli flakes that pack a potent punch of flavour. You can dip the calamari in this too, or sprinkle it on pizza/pasta. 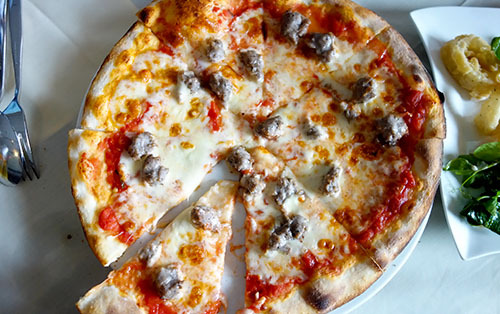 The Salsiccia – tomato, mozzarella, homemade pork sausage was a large pizza dotted with very yummy sausage. It is a very typical Italian pizza that comes with a scattering of ingredients, and you’re supposed to enjoy the fresh tomato sauce and dough. I will be frank here. And I don’t know how else to put this without sounding like a greedy pig… but… I like my pizzas with thick crust! You know, Pizza Hut style? I know all the food connoisseurs and Italians are now rolling their eyes in disgust, but I like it thick crust simply because it…. errrrrr…. fills me up. I find that when I eat thin crust pizza, I can eat a whole ton and not be that full. I NEED MY CARBS. Man, the pastas here are top notch. 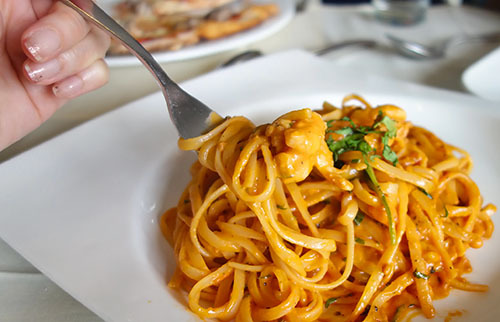 The Linguini Alle Cicale – crayfish in pink sauce was my personal favourite. The pasta was cooked perfectly al dente, and I’ve decided that ‘pink sauce’ is my favourite for pastas, which is basically a term for a tomato cream sauce. Trattoria Bonissima offer pink sauce for quite a few of their dishes and I am a total convert. I particularly like it because it’s not as rich and flat as a cream sauce, and not as tangy as a tomato sauce. It’s somewhere inbetween. There were large chunks of crayfish in there, which were lovely and sweet against the sauce of the pasta. The portion size is substantial too. Obviously I insisted on the Tiramisu. Can never resist this dish though I’m frequently disappointed by it in Singapore. 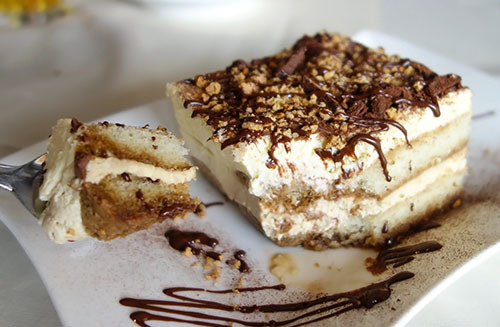 I specifically like my Tiramisu very wet and moist, with a high cake ratio. What more can I say? 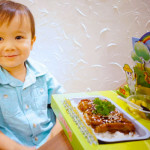 Look at the photo below! I’d heard that the Lava Cake was a must order, so promptly got that too. 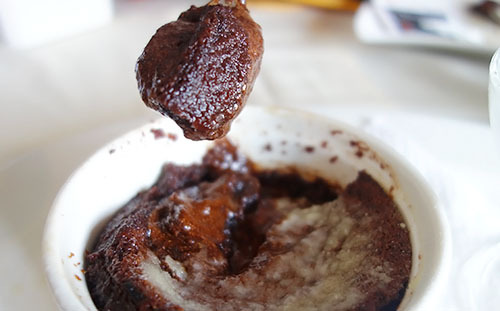 Made with rich French chocolate, this little molten pot of goodness gives you the choice to flambé – which they light up at your table – excellent entertainment especially if you have kids there. Be warned though, the alcohol does mean the sweetness of the chocolate is brought into stark contrast with the alcohol flavour – so this particularly suits those that aren’t too fond of super-sweet desserts. 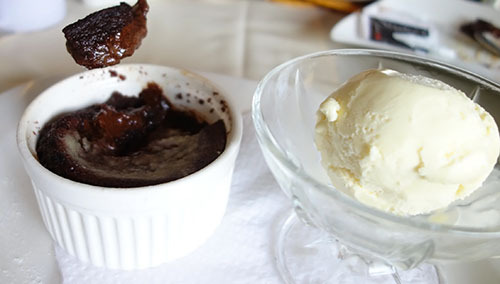 It’s served with vanilla ice cream, which brings down the richness of the molten chocolate (and boy, is it molten, almost like a thick chocolate pudding!). I would prefer a creamier vanilla bean ice cream though. Doesn’t this make you want to *poke* your finger into the photo and take a lick?! There’s also a big sign in the restaurant with this cool offer: Get a complimentary dessert of the day (worth S$9) with every S$50 spent, paid by Amex card. Be careful when visiting their Facebook page, it contains heaps of photos of their food… not good to view on an empty stomach…. I was there for lunch, but I actually think it’d be really nice for a dinner date. It’s cozy and serves up some fab food. Plus, I’m craving that Stracciata again!!! 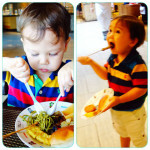 FOOD REVIEW: Swensen’s new “Garden Kids Meal”… with a shovel! u wanna replicate the Stracciata at Chris’s bday party barbie? i’ll bring the italian works since u r getting steaks anyway! Errrrr you are very ambitious! I am definitely not trying it cos it requires superb steak (that won’t give us food poisoning haha) and that balsamic/truffle oil mix. You really reckon you can? wow.. the food looks AMAZIN! 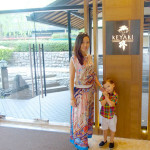 Nancy and I love Italian food and have a few favourite restaurants we go to… so delicious! Oh MAN, vodka-spiked pasta sauce? Now that is something an Italian restaurant should do here!! 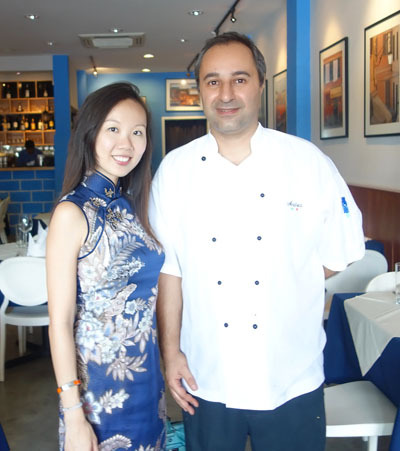 Thanks Trattoria Bonissima Italian Restaurant! It’s a lovely place for some good ‘ol Italian grub!